$1,499.99 Seen a lower price? The Roland V-Combo VR-730 delivers top-quality organ, electric piano, acoustic piano, and synth sounds in a travel-ready instrument with a 73-note waterfall keyboard. You don't need to carry around that heavy vintage combo organ, rotary speaker, and traditional EP anymore—the VR-730 gives you the essential sounds and authentic playability you need while saving your back. The onboard organs faithfully respond to classic techniques, while the historic electric pianos—which include a selection from the acclaimed RD-2000 Stage Piano—offer impeccable tone and touch. And with the smart user interface and direct access controls, you can focus on playing without being bothered with fussy adjustments and complicated settings. The V-Combo VR-730 is the perfect instrument for pro performers on the move, providing versatile, gig-ready sounds in a highly mobile package. Detroit-based soul/funk musician Amp Fiddler plays the VR-730's organ with authentic rock-style drawbar settings (88 8800 000), along with overdrive and the newly developed rock rotary sound (Type 3). Detroit-based soul/funk musician Amp Fiddler plays the "75 Tine EP" sound derived from the RD-2000, enhanced with auto-panning tremolo and a deep reverb effect. Detroit-based soul/funk musician Amp Fiddler plays the VR-730 with a split keyboard setup. He's using an electric piano tone ("75 Tine EP") for the upper key range, and a synth bass tone ("Chow Bass") for the lower key range. Detroit-based Amp Fiddler is a celebrated soul/funk musician who has shared stages and studios with everyone from Prince and George Clinton to Primal Scream and underground Detroit producer Moodymann. 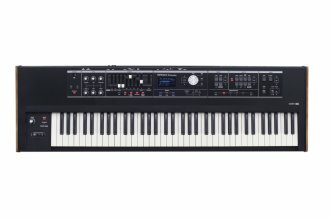 The VR-730 is equipped with a 73-note waterfall keyboard with semi-weighted action, ideal for playing traditional organ techniques like trill, sputter, glissando, and percussive hits. As soon as you put your hands on the keys, you'll feel right at home with the smooth touch that has just the right amount of resistance. The quick response thanks to Quick Firing feature makes it easy and comfortable to play fast passages, percussive attack expressions, and soft glissandos. The waterfall shape also provides a friendly feel for piano players, and the extra octave is a welcome addition for those used to 61-note keyboards, offering extended playing range and bigger zones for splits. Vintage gear is great, but it's not very practical for the average working keyboard player who needs to travel light. A combo organ, rotary speaker, and electric piano can add up to several hundred pounds, and are very bulky and difficult for one person to move. The VR-730 includes all these sounds and more in an instrument that weighs just 21 lb. 14 oz./9.9 kg, so it's a breeze to transport and even easier to set up. And with support for battery operation, the VR-730 delivers the ultimate mobile convenience for street gigs, weddings, and various on-the-go events. The VR-730 was designed from the ground up with the needs of live players in mind. Its smart, nicely organized front-panel layout features a clear LCD screen and dedicated organ, piano, and synth sound sections. This gives you direct access to all the essential sounds you need, plus lots of real-time controls for expressive tone manipulation. Seven simultaneous effects include rotary, delay, reverb, tone, overdrive, compressor, and MFX, and the dedicated knobs tweak multiple parameters for powerful sound shaping with minimal effort. It's also simple to set up splits and layers on the fly, and to save all your settings in user memory locations for instant recall on stage. With the VR-730, you're able to deliver authentic organ performances with all the tonal characteristics of revered vintage combo organs. Roland's latest Virtual Tone Wheel Organ engine faithfully emulates the sound-generating process of a real tone wheel organ in every way, while nine harmonic bars provide classic hands-on tone control. Rotary effects are vital to the combo organ sound, and the VR-730's three genre-oriented types make it simple to call up the right rotary tone for any style, from gospel and pop to jazz and rock. You can also deepen the sound further with the Twin Rotary effect, add some grit with tube-style overdrive, or call up the ring modulator for a more aggressive sound. Piano is a cornerstone sound for live playing, and the VR-730 provides a wide selection for covering all musical styles. Many historic electric piano are on board, including a selection derived from the RD-2000. You can also spice up your EPs with vintage effects like phaser, tremolo, touch wah, and tape delay. The gorgeous acoustic grand piano features 88-note stereo multi-sampling, delivering pro-level tone that rivals Roland's dedicated stage pianos. The VR-730's easy-access compressor effect works great with the piano sounds, ensuring that your playing always cuts through when performing with loud bands and big ensembles. The VR-730 is packed with a ton of ready-to-play synths, from Roland analog classics like JUNO strings and JUPITER pads to textured, modern-era digital tones and beyond. There are lots of fat, analog-style lead and bass tones to choose from as well, plus organic '80s-era synth sounds from Roland's famous D-50. The 200-plus sounds cover a wide range of styles and genres, and are organized into dedicated one-touch categories like Lead, Bass, Pad, Strings, and more for fast access. The VR-730 offers a classic streamlined appearance with real wood side panels, delivering the authentic vibe of a vintage combo organ. The control panel's matte finish hides fingerprints for a clean and tidy look, and also eliminates harsh reflections from stage lighting that can reduce visibility. 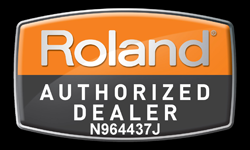 Roland's Axial site is the official tone library home for downloading new sounds for Roland keyboards. Specially designed by top programmers, "The Cover Band Collection" for the VR-730 provides dozens of patches inspired by popular songs, giving you lots of ready-to-play sounds for all types of gigs. Be sure to check Axial often, as Roland is always adding new sounds for the VR-730 and other Roland instruments. The free VR-09 Editor app for iPad gives you powerful, intuitive control of the VR-730's organ and synth sound engines via your tablet's full-color touchscreen interface. Quickly edit organ sounds and customize vintage tone wheel characteristics such as leakage, click noise, and rotary speed, and easily access synth sounds to build custom tones and layers. After tweaking sounds at home, you can take your iPad to the gig and use the app for extra real-time control on stage. Cable-free communication between the VR-730 and iPad is simple to set up with Roland Wireless Connect. Alternately, you can link up with a standard USB cable using the appropriate adapter for your specific iPad model. - *GM2 compatible sounds are included. - *1 When using the KS-18Z, ensure that the height of the unit is one meter or lower. - *2 Use a commercially available USB flash drive or a USB flash drive sold by Roland. However, we cannot guarantee that all commercially available USB flash drives will work with this unit. Available until 11 PM (EST) today. Mention special code 20Y-WB3H when you call.